Scotland’s First Minister Nicola Sturgeon has poured scorn on plans to bring back the blue cover for the British passport as “insular, inward looking, nonsense”. 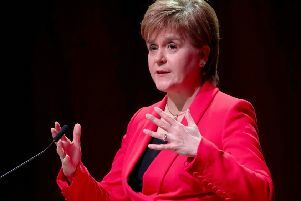 The SNP leader clashed publicly with Theresa May after the Prime Minister hailed the move as an expression of the UK’s post-Brexit “sovereignty and independence”. The spat was sparked by a Home Office announcement that British passports will again have blue covers once the UK has left the EU in 2019. The new design, which will no longer include the EU insignia, will replace the EU-style burgundy cover that has been a feature of the UK passport since the 1980s. Mrs May tweeted: “The UK passport is an expression of our independence and sovereignty - symbolising our citizenship of a proud, great nation. That prompted Ms Sturgeon to tweet back: “The open, inclusive, civic, internationalist Scottish independence movement that I’m so proud to be part of could not be further removed from this insular, inward looking, blue passport-obsessed nonsense. Announcing the change, Home Office Minister Brandon Lewis said the new passport would be the “most high-tech and secure we have ever seen”. It follows the announcement earlier this year of a £490 million contract to redesign and produce a new version of the document. The passport is routinely redesigned every five years and Eurosceptics view the new contract as a way to ditch the EU burgundy cover in favour of a return to the colour of the past. Mr Lewis said: “Leaving the EU gives us a unique opportunity to restore our national identity and forge a new path for ourselves in the world. The new passports will be phased in after the UK leaves the EU on March 29, 2019. Burgundy passports will continue to be issued, although without the European Union markings, until the current supplier’s contract expires in October 2019. Blue was first used for the cover of the British passport in 1921, but the design changed in 1988 after the UK joined the European Economic Community and burgundy was chosen as the common colour. Among the new design features will be a new picture page made of a “super-strength plastic polycarbonate material that will be more difficult to alter”, the Home Office said. The move was warmly welcomed by Brexit supporters, with Tory MP Andrew Rosindell describing it as “a great Christmas present for the British people”.